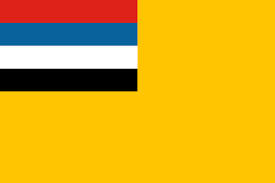 The New Republic of Manchuku is a nation led by Minster Kimusta Chinjing on the continent of Europe. The New Republic of Manchuku's government is a Parliamentary Democracy with very moderate social policies. Economically, The New Republic of Manchuku favors left wing policies. The official currency of The New Republic of Manchuku is the Zloty. At 237 days old, The New Republic of Manchuku is an old nation. The New Republic of Manchuku has a population of 197,442 and a land area of 5,994.65 sq. miles. This gives it a national average population density of 32.94. Pollution in the nation is a disaster. The citizens' faith in the government is completely depleted with an approval rating of 0%. The remnants of China still controlled Manchuku. This in 2007 lead to the biggest terrorist attack of the world. MRLA smuggled a Russian Nuke Suitcase Spec and detonated in Beijing killing 7 million people. China tried invade the Manchuku region, but failed and in 2010 granted Manchukuo independence. 04/13 03:38 pm - The New Republic of Manchuku had war declared by Reno Caca for the reason of "You're a disease, and I'm the cure.". 04/02 10:42 pm - The New Republic of Manchuku had war declared by New Mombosnia for the reason of "You are a threat to all of humanity". 04/02 11:47 am - The New Republic of Manchuku had war declared by Juzestan for the reason of "A not-so-general dispute". 03/23 01:28 pm - The New Republic of Manchuku had war declared by United States_Of America for the reason of "Inactive Raid". 03/15 03:31 pm - The New Republic of Manchuku had war declared by Ironfist for the reason of "Gib me all ur moneyz". 03/13 06:39 pm - The New Republic of Manchuku had war declared by huiland for the reason of "We like taking candy from babies". 03/08 04:22 pm - The New Republic of Manchuku had war declared by Villomore for the reason of "I come to liberate your people". 03/03 02:26 am - The New Republic of Manchuku had war declared by Kingdom of the Ancient Isles for the reason of "Raid". 02/21 03:46 pm - The New Republic of Manchuku had war declared by Yagovalsk for the reason of "Say hello to my little friend!". 02/13 12:46 pm - The New Republic of Manchuku had war declared by allun for the reason of "Gib me all ur moneyz". 02/06 07:58 pm - The New Republic of Manchuku had war declared by The Great Vietnam for the reason of "bro i just need money and resources chill". 02/06 05:28 am - The New Republic of Manchuku had war declared by Barus for the reason of "Get off my plane.". 02/05 01:16 pm - The New Republic of Manchuku declared war on Petramia for the reason of "Hasta la vista, baby!". 02/05 01:15 pm - The New Republic of Manchuku declared war on Bonostan for the reason of "Dead men taste like chicken.". 02/05 01:13 pm - The New Republic of Manchuku declared war on City of Bones for the reason of "Revenge". 02/02 02:42 pm - The New Republic of Manchuku had war declared by Lego Town for the reason of "We like taking candy from babies". 02/01 10:54 pm - The New Republic of Manchuku had war declared by Themos for the reason of "Srry u,w,u". 01/27 09:46 pm - The New Republic of Manchuku had war declared by North Brisbane for the reason of "Dead men taste like chicken.". 01/21 06:38 pm - The New Republic of Manchuku had war declared by Dune for the reason of "Luke... I am your father. ".